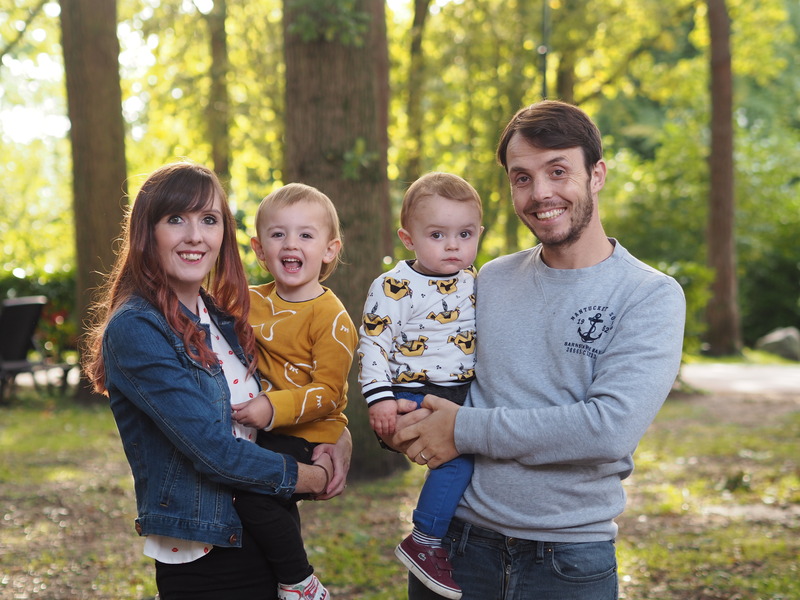 EVERY holiday has those stand-out moments that you’ll never forget, and our week at Eurocamp’s Duinrell parc was no exception. Imagine eating pancakes beside a vintage carousel, spotting red roofs and church spires from the top of a big wheel, and watching red squirrels jumping through the trees. 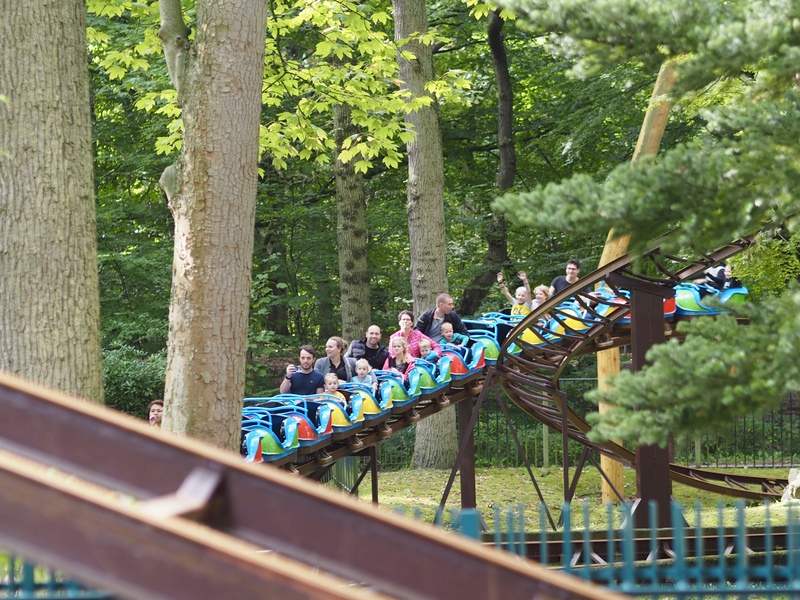 These are just some of the things that make Duinrell stand out from other holiday parcs. 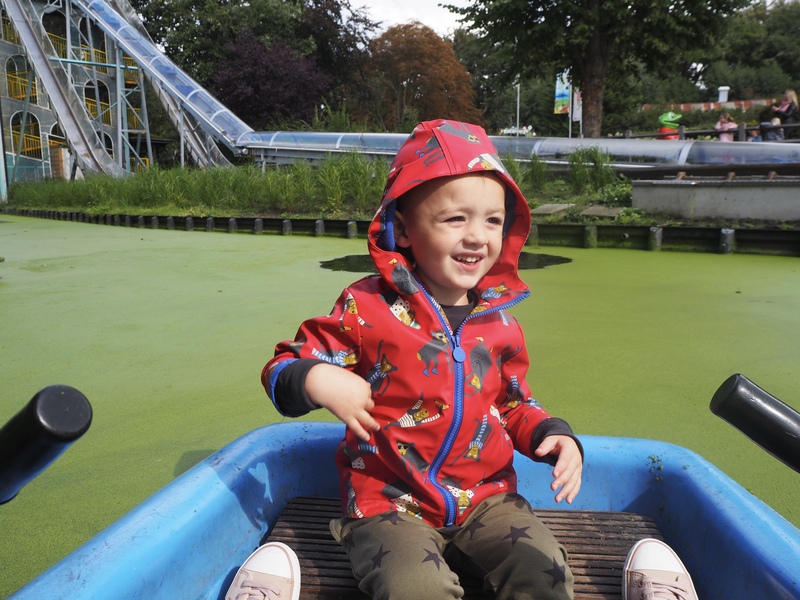 If you’ve never been, and it’s pretty unlikely you have as South Holland doesn’t seem to be on many people’s lists, you probably won’t have heard of Duinrell. 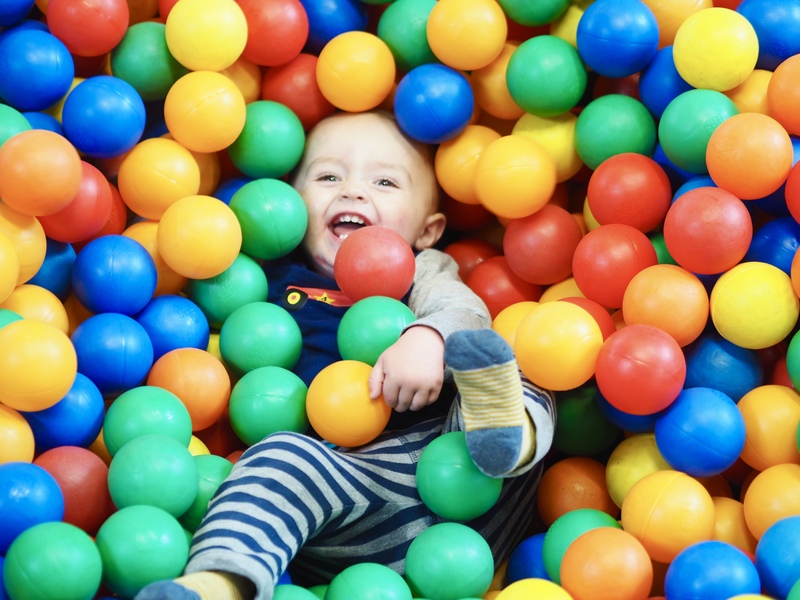 We hadn’t until earlier this year when we checked out Eurocamp’s most toddler friendly locations. 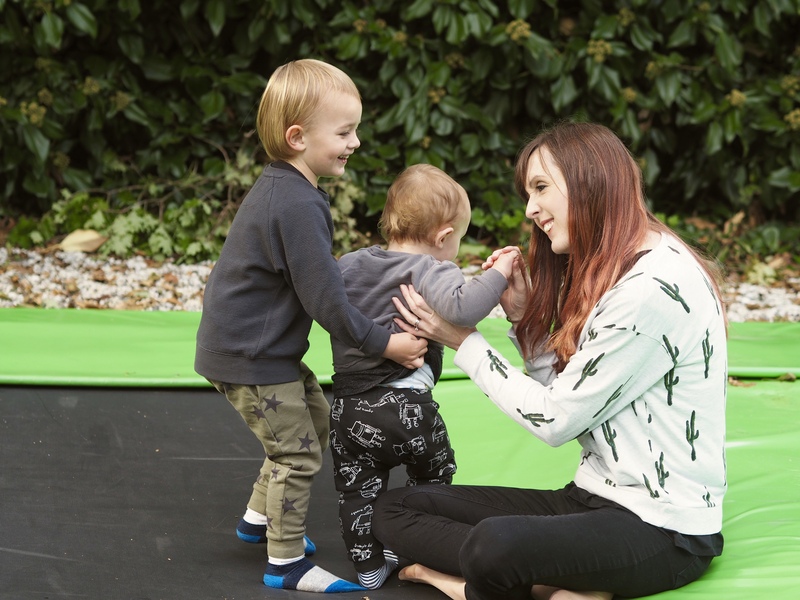 It’s one of the reasons we chose to go there – it’s somewhere a bit different and seemed to offer lots of activities for families. It helped that we could fly from Cardiff to Amsterdam with KLM, which made the journey a lot shorter than having to venture over the Severn Bridge. We’ve stayed with Eurocamp once before at the slightly sleepy but beautiful Domaine des Naiades parc in the South of France. We spent our days there exploring the pretty nearby towns and taking in the autumn sun. 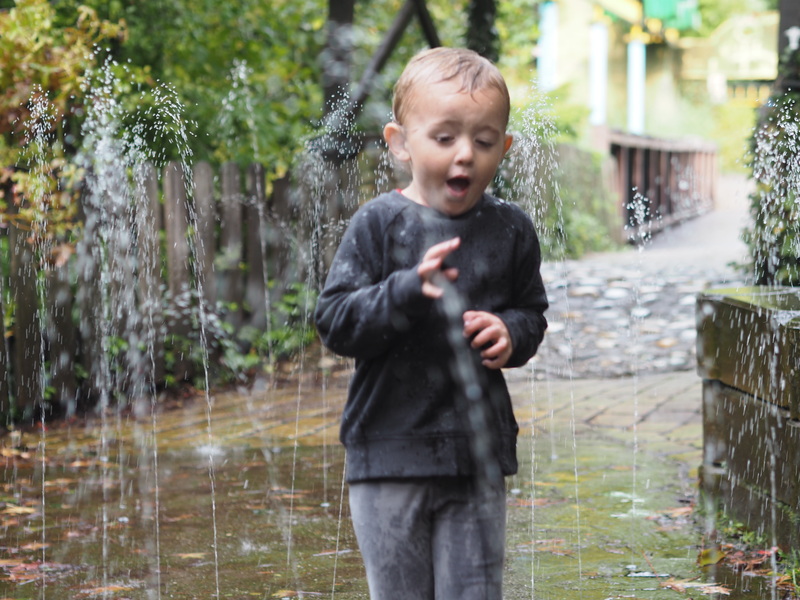 Set in a theme park with a huge indoor swimming pool, Duinrell couldn’t be more different. The rides were a couple of minutes’ walk from our accommodation, and yet it was still so peaceful sitting on our deck under the trees that you couldn’t imagine the rollercoasters and fast food kiosks being just over the stream. 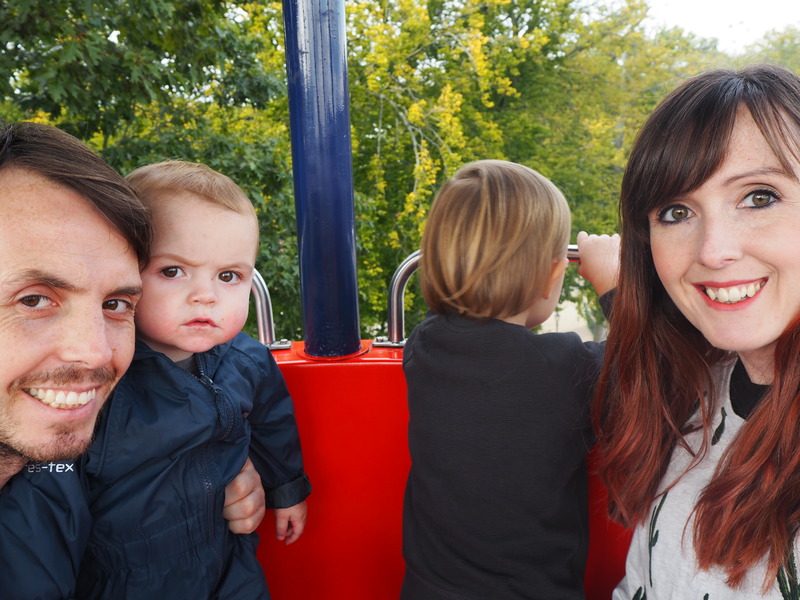 We expected our two boys, aged three and one, to be a bit young to appreciate the theme park, but we ended up spending a few days out of our week there. Entry is free for guests, and there’s no extra charge for the rides, so you can just pop in and out as you fancy. Wandering around on our first day, I was impressed at how many rides were suitable for young children. 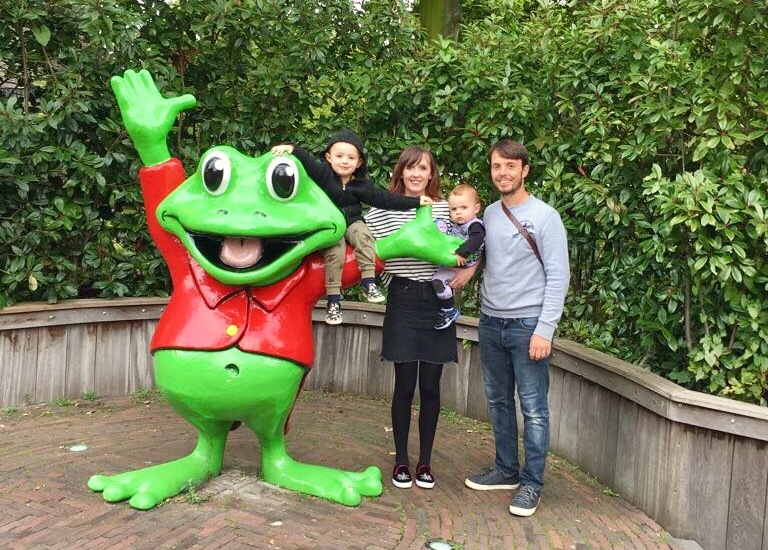 When Santi, three, discovered the Kikkerachtbaan rollercoaster there was no way of getting him off! We rode it five times in a row, and every time he was beaming going down the drops and running to join the queue as soon as we’d stepped off. Ezra, aged one, wasn’t left out either. 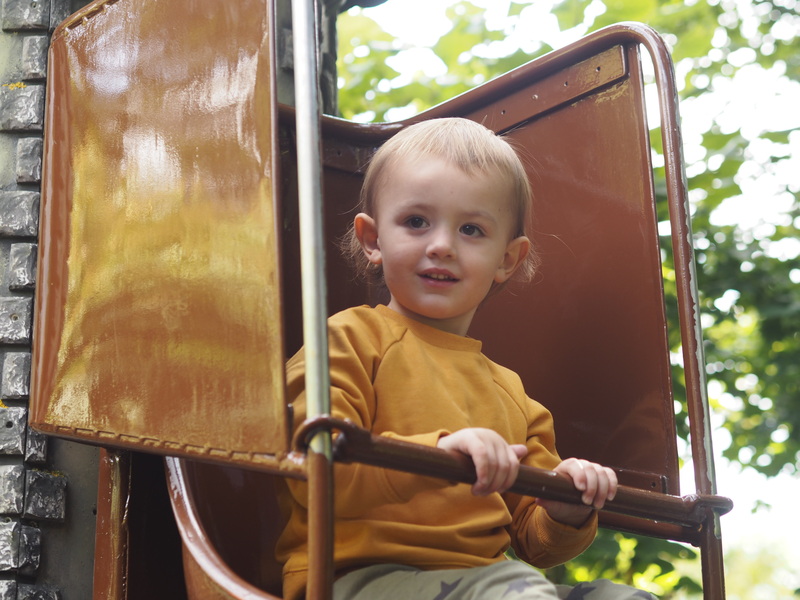 It took a bit of persuading to get him on a train ride but once he was on, like his big brother he was hooked. He told Stew off with a firm shake of the head when he tried to unclip him from the seat. Pesky babies knowing what they want! Presumably because we were just out of season, this particular ride was only open for half an hour each day … we made the most of that half an hour window! 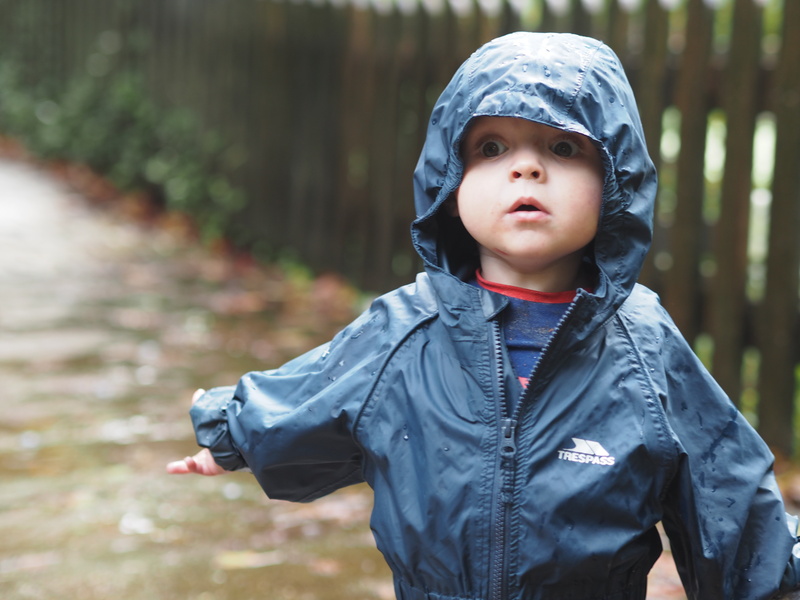 This wasn’t Ezra’s favourite part of the park though – we discovered that on day one, when by chance he was very luckily dressed in an all-in-one rain suit…. We were looking for the start of the monorail when we could see children sprinting back and fore down a path and wondered what on earth was going on. It turns out there were fountains spraying up intermittently from the floor and they were trying to dodge them. Not Ezra. 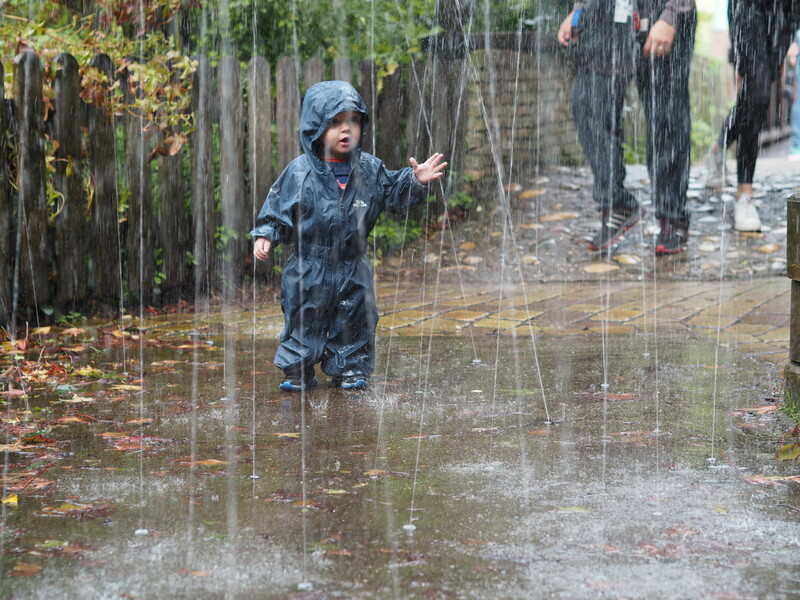 No, he waited until the water started and stood in the middle dancing around in excitement. I don’t think he’s ever enjoyed something as much. He looked super cute with his little smiling face peeping out of his hood, and everyone stopped to watch him. Santi wasn’t dressed quite so appropriately, but he wasn’t going to let that stop him getting in on the action! This path led to a fab section for younger children based on nursery rhymes and fairytales with lots of little rides. Most of them are unmanned, so you pop your child on, secure them in and press the button to start it yourself. At one point we turned round to sort Ezra out, and within the space of about two minutes Santi had spotted a ride he liked the look of, strapped himself in and pressed start … no need for parents! You just need to get over the odd plastic babies dotted around that wee over you when you walk past … slightly creepy to me, hilarious to a three-year-old! 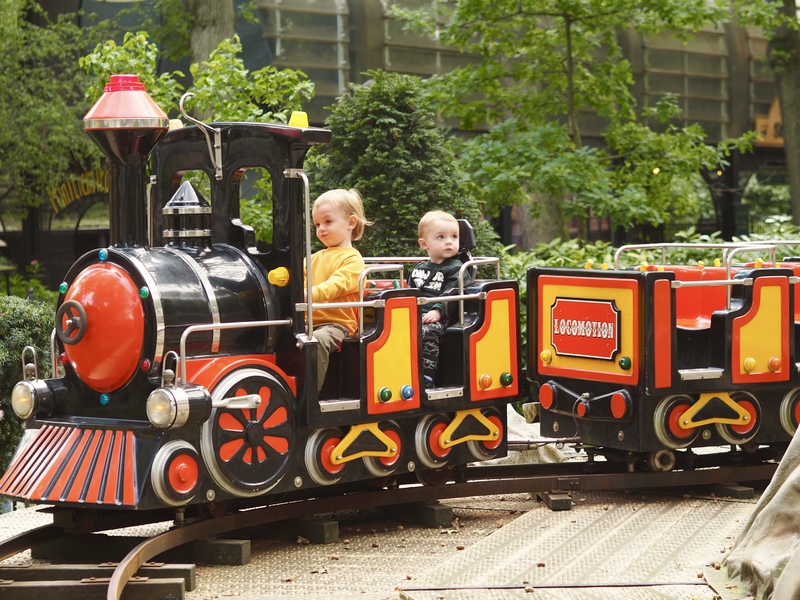 If you don’t have little thrill-seekers like our two, there are plenty of alternatives to rides in the park. 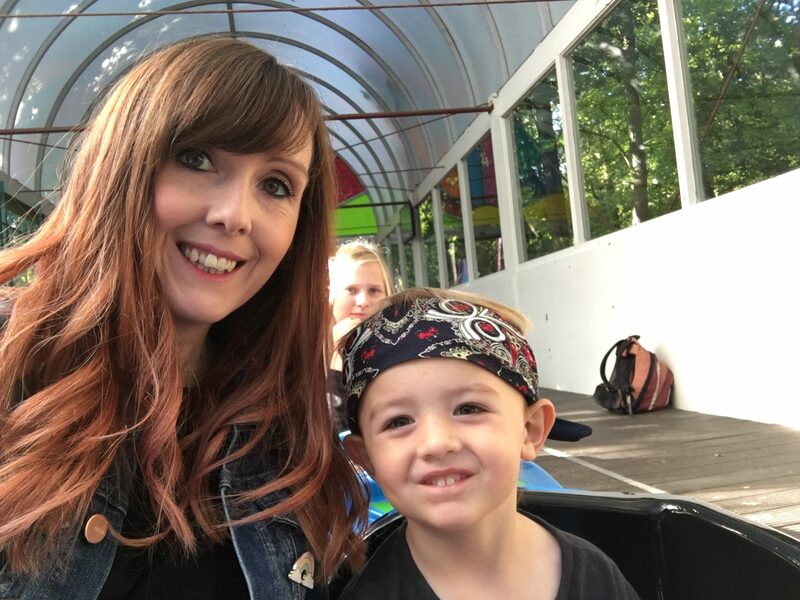 A fab park with super long slides (which was open at all times – perfect for early risers), trampolines and huge ball pool (and I mean huge, we could have lost one of them in there), all went down well. 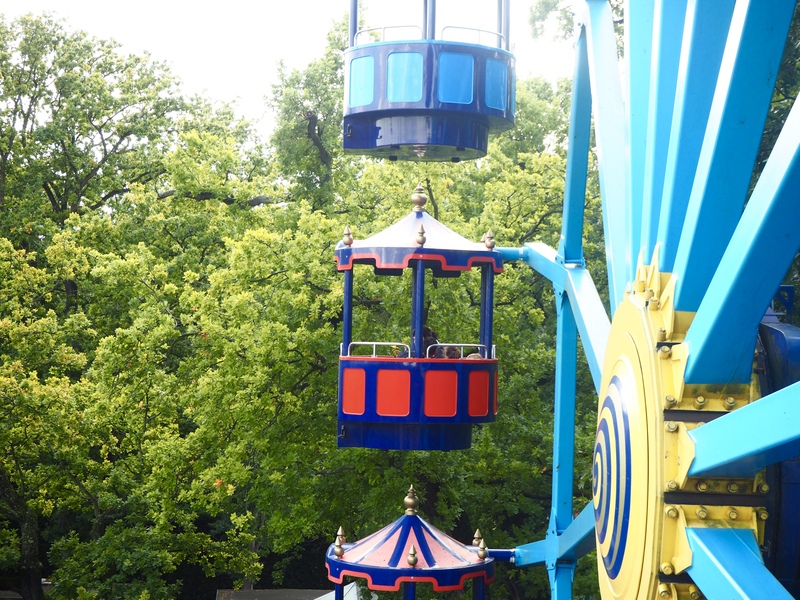 And it turns out September was a fab time to visit Duinrell as we hardly queued for any rides. There were a few school trips through the week, but as long as you didn’t end up at the bumper cars at the same time you were fine. Getting in a rowing boat with this monkey seemed like a great idea until he insisted on taking charge of the oars and leading us into the fountain. 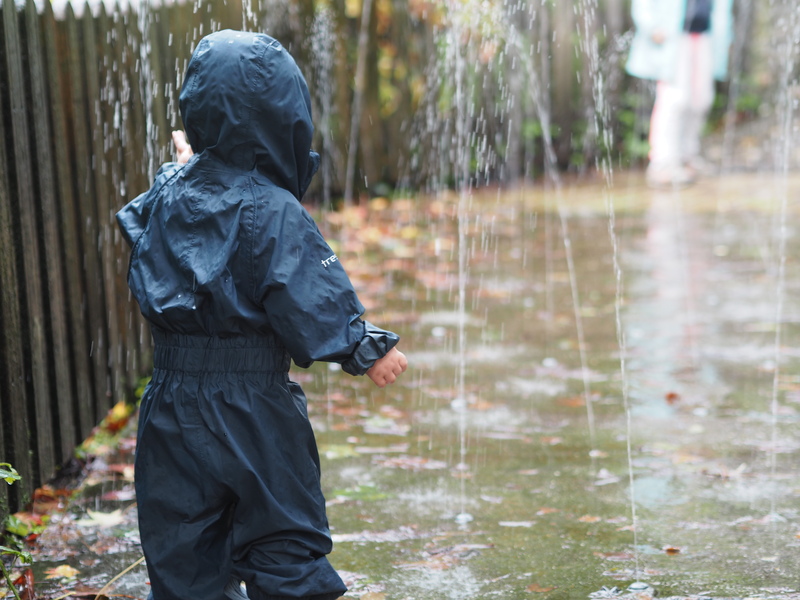 We seem to have a theme of getting wet! One of the highlights of the week, and probably both Santi and Ezra’s favourite part, was the Tiki swimming pool. It is an additional cost at 5euro per adult for two hours, but it’s a bargain for what you get. We ended up going three times, and were queuing at the door to get in when it opened at 10am we were so keen! I was honestly blown away by the pool the first time we went. 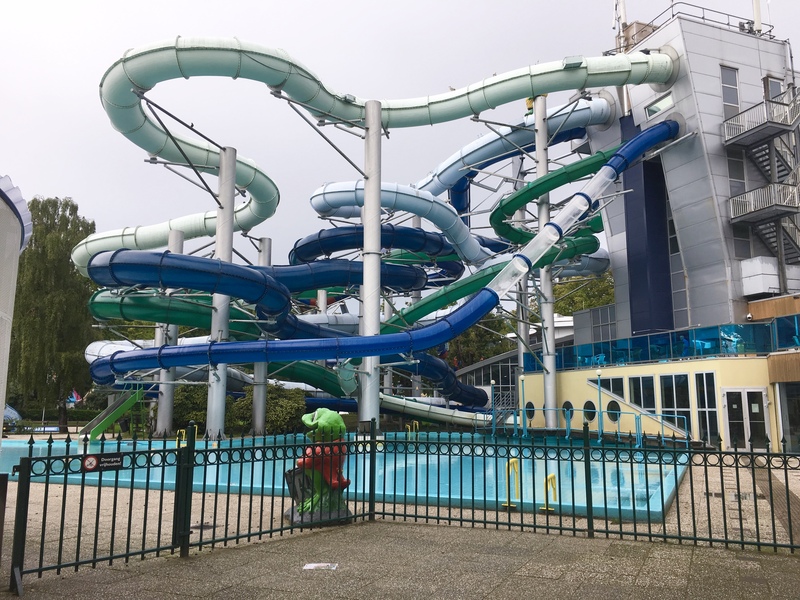 There’s just so much to do – a wave machine, lazy river, baby area, tiki pool for young children, and at least 10 different slides. Of course, some of the slides were for adults – like a vertical drop that Stew was brave enough to attempt – but Santi was able to go on a fair few. I was impressed that they let little ones sit on your lap if they don’t reach the height restriction, so they don’t miss out. Within a few minutes of getting in we had one child throwing himself head first down a slide and another dragging us to the waves. I’ll never forget a very large man screaming all the way down one of the slides and crashing into the water looking terrified, only for Stew to follow with Santi on his lap shouting to go again! Be prepared: it’s not an embroidered sun hat and pretty bikini kind of pool. I made the mistake of wearing mascara the first time and looked like a panda after one slide. This is all about the fun, not looking good. I never thought we’d holiday in a theme park, but it turned out to be a great decision. There was so much to do on site that there wasn’t a chance of getting bored. We even experienced a Dutch music festival on the last day when 15,000 people descended on Duinrell for the annual Tina festival – I’ve never seen so many teenage girls in one place! I might have had aching legs at the end of the day from climbing the steps to the pool or walking around the park for hours, but waking up in the morning to excited little faces ready to go again was worth it! We flew with KLM from Cardiff to Amsterdam, and took a 30-minute taxi ride to Duinrell, in Wassenaar (88euro one way, 70euro on return journey). To get to Amsterdam from the park, you need to take a bus to Leiden, then a train. It was a step too far for us with the boys being so young, but I think if we’d hired a car we’d have gone for it. We stayed in a three-bed Avant home, which was plenty big enough for three of us. My top tip is to pre-book as many extras as you need – baby bath, bed rails, potty, bathroom step, pool towels etc. This makes life a lot easier when you arrive. Packs including washing up liquid, cooking oil, bottled water and essentials like tea, coffee and wine are also available to pre-book. On-site facilities include the theme park, Tiki swimming pool, supermarket, bar, plenty of restaurants and takeaways, bike hire, Eurocamp reception with incredibly helpful staff, and a bus stop if you’re heading further south. During the summer season there are children’s activities running through the day. We made it to the last disco of the season, and all the children were loving it! The nearest town, Wassenaar, is a short walk from Duinrell and has everything you’ll need. The Jumbo supermarket has a fab selection, there’s a cheese shop next door and if you’re really missing home, Kelly’s ex-pat shop across the road! It was fab. There was so much to do!